Side-dungeons where you go through hordes of enemies are nothing new for Zelda. In both The Wind Waker and Twilight Princess, the dungeons were nothing more than the same type of room repeated over and over again, with progressively difficult enemies being found the lower you descended into the cave. While I simply enjoyed it because I find combat in Zelda games to be super fun, even if it isn’t the most difficult, I can understand those who criticize them as being uncreative, because it’s true that the dungeons didn’t really have much going on in them except for tons of enemies to fight. Nevertheless, I never used this as a criticism of these dungeons because I simply appreciated the chance to truly refine my skill in Zelda without having anything else to distract me. After playing The Trial of the Sword and then looking back on these previous dungeons, I don’t know if I would enjoy them as much today. The Trial of the Sword has spoiled me. The Trial of the Sword is much like an extended version of Eventide Island, where all of your equipment is taken from you and you must rely on what you’re given. The difference is that on Eventide Island, you could run from fights as long as you got the Spirit Orb first. In The Trial of the Sword, you are required to defeat every enemy in the room, similar on the surface to The Savage Labyrinth and Cave of Trials/ Shadows from The Wind Waker and Twilight Princess/ HD, respectively. But the similarities between the two really end there. Breath of the Wild is a massive open-world game where you can do virtually anything in any order you please, meaning that you can take on The Trial of the Sword whenever you want once you get the Master Sword. And while The Wind Waker and Twilight Princess especially have a comparatively more linear structure, their “caves” can be tackled from many different points in the game, leading to some people going in with better gear than others. In the latter two, this means that those who have already put a large amount of time into the game before taking on these “caves” won’t find as much of a challenge as those who brave them the second they become available. In addition, you can stock up on fairies, Grandma’s soup, etc. to make sure that you are prepared. However, by taking away all of your gear from the start, you can only have four different advantages that you can take with you into the trial: more hearts, more stamina, upgraded bombs, and upgraded stasis. How hearts and stamina benefit you should be obvious, but the upgraded bombs allow you to recharge bombs faster with a larger blast radius, and stasis is easily the most useful as it allows you to freeze enemies for a short period of time, allowing you to deal more damage. Each five or so rooms has a theme surrounding it, such as everything being on fire, darkened, or there being a constant updraft. Even so, each room is built differently. Whereas in previous installments, it was the same exact room copy-pasted with different enemies, there are different tree houses, skull bases, pillars, and ruins that either you or your enemy can use to your or their advantage to make combat a lot more dynamic. While combat is mandatory, how you want to go about vanquishing your foes is almost as up to you as it is in the rest of the game; you just don’t have the high attack or defense that you’re used to. You can at least temporarily increase your attack and defense, as well as heal hearts and so on by cooking. Every five rooms or so, there will be a bit of a rest stop where there are no enemies but instead a pond with fish, three treasure chests, crates of food, fairies to catch, and a pot under a lighted fire. It looks serenely peaceful and exactly like the kind of place where I’d want to take a nap, but it’s also a blessing whenever you find it because it allows you to gain a lot more resources and prepare for the trials ahead, as well as just take a breather. There are three sections of The Trial of the Sword: beginner, middle, and final. This essentially gives you two checkpoints (as beginner will start you in the very first room), but remember that these are two checkpoints over what is a four-hour dungeon on average if you finish it without dying on your first try. That means that if you die on one of the later stages, you might lose up to an hour of progress. That’s a steep punishment for a game that usually doesn’t punish you at all for dying, and it raises the stakes to really get your blood pumping and inspire you to constantly be at your best. If you feel like you’re at a point where you can beat, for example, beginner and middle but not the final floors (and boy do those last few stages get tough! ), don’t worry. The reward is incremental. Each time you beat one of the three sections, you will be rewarded by an upgrade to the Master Sword’s attack by 10, as well as slightly extending its charge before it runs out of energy, but not by much. (Kinda like iPhone upgrades lol) But if you can defeat every single floor from the Trial of the Sword, you will get the sword’s true form, where it is constantly at 60 attack and has the longest charge, as well as being all glowy, which is always a plus. Basically, the sword will act like you’re at Hyrule Castle wherever you are in Hyrule. 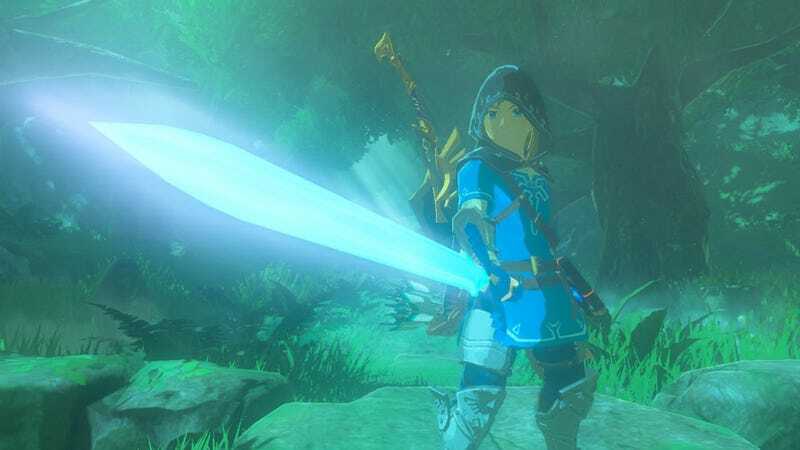 Before, I seldom bothered using my Master Sword when it was at its base 30, but a 60 attack weapon that’s easy to yield and never breaks for good makes it my go-to weapon most of the time, as long as it’s charged, so I’d say that even though the Trial of the Sword is now probably the most challenging part of Breath of the Wild, the reward is well worth it.